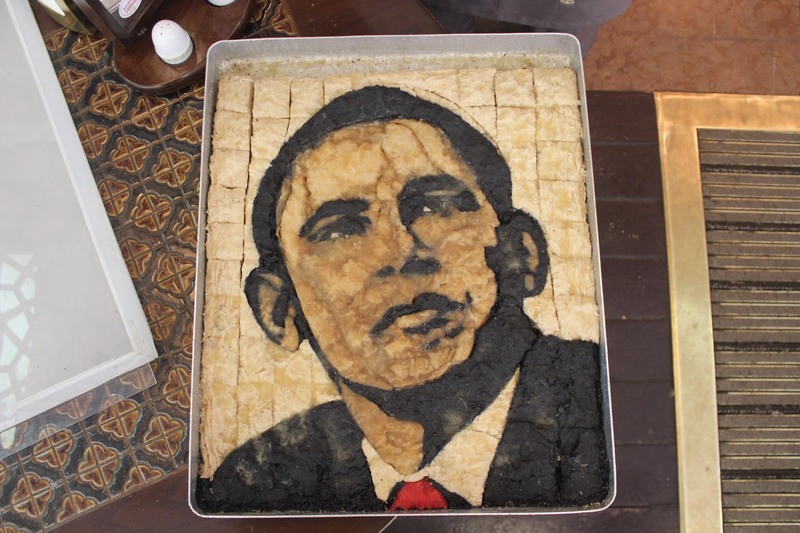 What is the size of a large cookie pan, made out of baklava, and looks like a lumpy version of the famous Hope portrait of Barack Obama? The “Baracklava”. The idea was cooked up in the Gulloglu baklava shop in Istanbul. In the shop’s six decades in business, only three other historical figures, all Turks, have been so honored. Owner Nadir Gullu says the portraits require enormous craftsmanship. Gullu doesn’t like politics. But he says he and other Turks had high expectations of Obama and they were dashed. “As a master Turkish chef, I made this baklava to show the newly elected leader of the world that if you eat sweet you will talk sweet. I was hoping for peace because when someone eats baklava, their level of serotonin increases and that increases happiness. But he misunderstood. And he brought war instead of peace,” Gullu says. The shop smells sweet, of butter and syrup, an ambiance not conducive to talking politics. Turks were clearly excited by Obama’s visit in April of 2009. But as chef Gullu says, disappointment soon set in. Indeed, Obama did try to tamp down the high expectations during his visit. He said that US foreign policy is a big ship which takes a long time to turn around. Ayten Sucu, a biology teacher, says she’d still vote for Obama. “I think he has solved problems which other presidents have been unable to, like health care reform. His own mother suffered from cancer and had trouble getting medicine. He cares about how the lower classes of society feel. He feels close to those people,” Sucu says. Another customer Aykut Calikusu says he supports Romney. But for a different reason: Obama is too close to Israel. “Even though they say that Obama is a Muslim, I think Romney will have closer relations with Turkey than with the Jews,” Calikusu says. With the Syrian civil war heating up on Turkey’s southern border and escalating attacks by Kurdish militants, Turks have not been focusing much on the US elections. Just ask anyone at the Gulloglu shop. Most will tell you: they’re much more interested in baklava than the Baracklava.